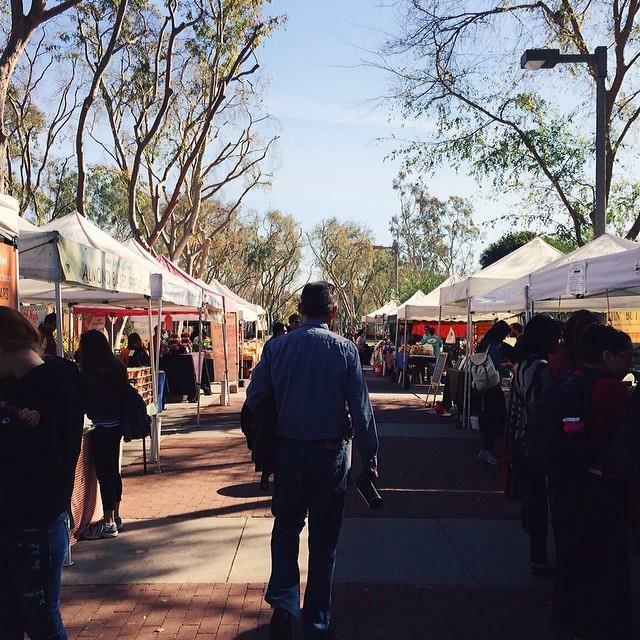 Today's farmer's market, hosted by ASI, took place at Friendship Walk. This ongoing event started on March 27, 2013 and has moved venues all throughout campus, from outside the Student Recreation and Wellness Center to Commencement Lawn. The farmer's market is a good experience for students to get involve and experience an authentic approach to eating healthy. Communicating with local businesses, branching out of their comfort zone and socializing with others helps create a unique experience of shopping for food. With offers of fresh fruits and vegetables and other delicious treats, vendors enthusiastically shared samples of their products to passing students. DJs from KBEACH was there to provide the musical beats, and gave away away free t-shirts if anyone could name a show that’s on 88.1 FM-HD3. Here's a couple of foods and booths you should check out the next time you go. Alex's Fruits and Nuts Plain and simple, this booth provides a large variety of fruits and nuts, from apple rings to glazed pecans. The Southern California-based venue also has an online front. Try out the fruit licorice, which is guaranteed to water your taste buds. Almond-based Spread If sweet isn't your thing, then this is for you. This spread is an alternative to hummus, because almonds has more protein compared to the chip peas used. There is also more fiber and less carbs. Peanut Butter/Almond Butter Many students crowded around this stand to get a taste of the varieties of butter from this stand, and the creaminess and taste is worth it. Salsa from The Fresh Dip For a change of pace, try out the fresh salsa available at the stands. Prices range from $4 to $6, but a popular item beyond the salsa is the guacamole. Mac N' Cheese with Cheetos? Take me to The Attic!